As urban areas continue to thrive, housing affordability has become a major issue in the U.S. Many people, since they can no longer afford to pay rent, are forced to live in a shelter, or on the street, if there are not enough shelter beds. According to the most recent Annual Homeless Assessment Report to Congress by HUD, around 553,742 people experienced homelessness in 2017, among which, over 40,000 are unaccompanied youth. This week is the National Homeless Awareness Week. Since we love data and maps, we thought we’d visualize the homelessness in four major cities, Dallas, Los Angeles, New York City, and San Francisco, in hopes that we can help draw attention to hunger and homelessness in different communities across the country. Homelessness is worsening in every city we looked at. 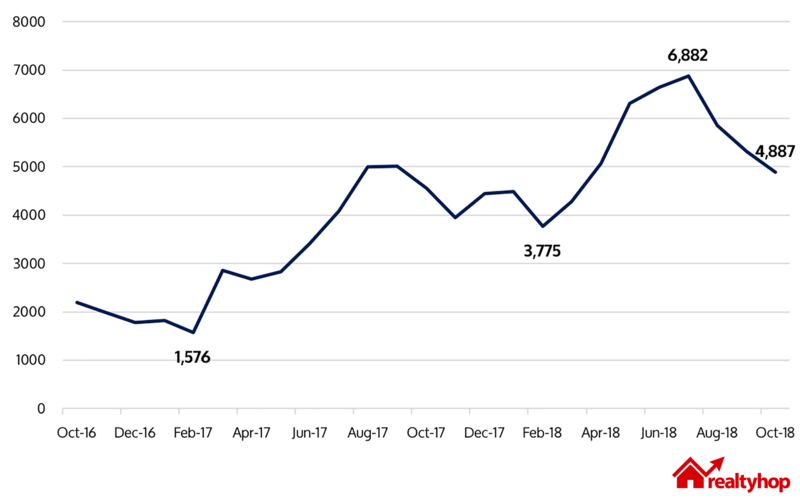 Dallas experienced the most drastic increase, with 2,936 encampments reported to Dallas311 from October 2017 to September 2018, 82% higher than what was reported from October 2016 to September 2017. The number of homeless encampments reported in Los Angeles reached its all-time high in October 2018, with 4,338 encampments reported to MyLA 311. Most homeless encampments in New York City are concentrated in Manhattan, with Midtown-Midtown East South being the worst of all neighborhoods. As of October 31st, 2018, 402 homeless encampments were reported in the neighborhood, around 200 fewer than 2017. While San Francisco is the smallest city among the four cities we chose, it has experienced the greatest number of homeless encampments. Over 15,000 encampments have been reported this year in Mission and over 12,000 in South of Market. Homelessness is becoming more and more concerning for Dallasites – in total 2,936 homeless encampments were reported to Dallas 311 from October 2017 to September 2018, around 82% more than what was reported from October 2016 to September 2017. The map below shows the number of reported homeless encampments in each district. Areas with darker shades have higher concentrations of homeless encampments, and the markers represent addresses with the most reported addresses. As we can see on the map, there is a correlation between proximity to the city center and the number of encampments. Districts closer to the city center received more encampment reports. District 7 (which includes zip codes such as 75216, 75217, and 75223) has seen 406 homeless encampments this year as of October 31st, around 10% higher than what was reported in 2017. District 13, which encompasses zip codes such as 75220, 75209, and 75204, has the least number of homeless encampments, with 35 reported as of October 31st, 2018. The number of encampments reported in Dallas started to rise by the end of 2017 and reached its peak in April 2018. It seems that September 2018 was a good month, but then, the city of Dallas has yet to release the 311 data for October 2018 and judging from the trend, the number will most likely be higher than what was reported in September. Chances are as you walk on the street this November in Dallas, you’d encounter a couple of homeless persons. Register for their Holiday Meals program here! The website is located at http://www.austinstreet.org/. Austin Street is fully booked for volunteer opportunities on Thanksgiving Day. But they always need people who support their mission on a regular basis! Check out their website now to find out more about. If you are interested in helping out during the holidays, please email [email protected]. As the second largest metro area in the U.S., Los Angeles has the second largest homeless population. In 2017, 55,188 people experienced homelessness, and the number has since increased. In total, 35,112 encampments were reported from October 2017 to September 2018, 51% higher than the number reported in the previous 12-month period. Downtown Los Angeles has the worst homeless encampment issue, with 2399 reported in 2017, and 2126 reported as of October 31, 2018. In addition, eight of the top reported addresses are located in Downtown Los Angeles. However, as the City of Los Angeles is the largest city in terms of land area, we clearly see that the patterns of proximity and number of encampments are less notable in Los Angeles. Woodland Hills-Warner Center, which is located by the city border, received 647 encampment reports in 2017. The number since has gone up drastically in 2018, currently at 1,013. The number of encampments reported in Los Angeles, sadly, has been growing in the past two years. From February 2017 to February 2018, the number of encampments reported every month had increased by 47%. 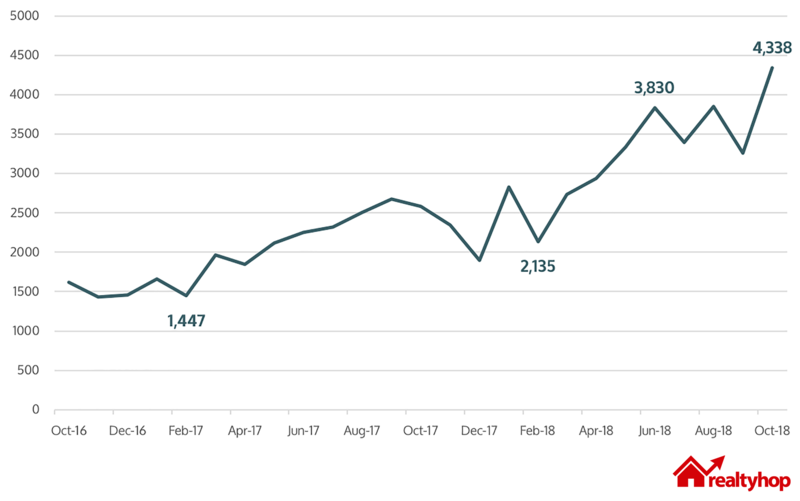 Since then, the number continued to rise and reached 4,338 as of October 31, 2018. Contact Los Angeles Mayor’s Office for volunteer opportunities, which can be found here. Volunteer at Los Angeles Mission now! As the biggest city in the U.S., New York City has long been battling homelessness. In 2017, there were in total 76,501 people documented as homeless persons. The city and non-profit organizations have several programs in place, offering beds, food, and even jobs. However, as the rents and home prices keep surging in the Big Apple, we could not help but wonder if the situation is only getting worse. What we found through the 311 data is that while the number of homeless encampments did go up, it is not as prominent compared to other cities. In total, 5,120 encampments were reported from October 2017 to September 2018, 11% higher than the previous year. As shown on the map, homeless encampments are mostly concentrated in Manhattan, with Midtown-Midtown South being the worst of all neighborhoods. The good news? So far, only 402 encampments have reported in the neighborhood, 201 fewer than 2017. West Village is another neighborhood that has seen more homeless encampments than others, with 275 reported in 2017 and 260 reported in 2018 as of October 31st, 2018. The number goes down as the neighborhoods get farther away from the city center. In Brooklyn, however, things seem to be worsening in Stuyvesant Heights, with 56 homeless encampments reported in 2017 and 130 reported in 2018. Other neighborhoods that have seen an increase in the number of encampments include East Williamsburg, Dumbo-Vinegar Hill-Downtown Brooklyn-Boerum Hill, and Prospect Heights. Compared to the other three cities, which are all in warmer regions, New York City has its own pattern. 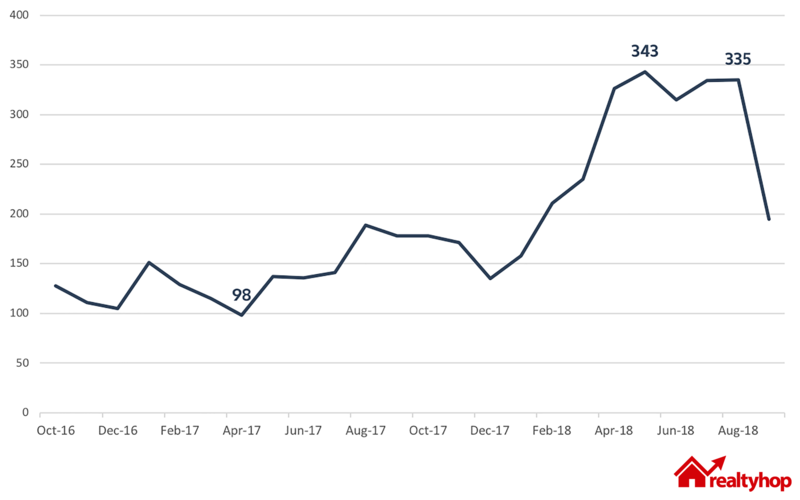 We can see in Figure 3 that the number of encampments is the lowest in winter, and yet as the warmer weather approaches, the number quickly goes up. However, when looking at the total number of homeless encampments reported to 311, one thing is clear – homelessness is worsening in New York City. Contact New York City Rescue Mission at [email protected] for volunteer opportunities. Volunteer at the Bowery Mission on Thanksgiving Day. Register now! Want to bring your kids with you? Join Feeding NYC now and help them deliver food to families in shelter. If you have been to San Francisco in the past decade, then you know what the city is facing. As rents and home prices skyrocket in the Golden City, more and more people are forced out of their homes. The nice weather, while a blessing for most San Franciscans, also attracts homeless people across the country. There are over 7,000 homeless individuals documented in San Francisco. Sounds a lot better than New York and Los Angeles, you might say. But the lack of shelters and a better system is putting the city in danger. From October 2017 to September 2018, 61,578 homeless encampments were reported in San Francisco, an increase of 75% compared to the previous year. In San Francisco, a lot of homeless encampments are concentrated in the city center. Mission has seen the greatest number of encampments among all neighborhoods, with 13,891 reported in 2017 and 15,785 reported in 2018, a 14% increase in a year. South of Market is another neighborhood with a high concentration of homeless encampments. In 2017, 10,088 encampments were reported to the SF 311. It has since then increased by 27% to 12,806 as of October 31st, 2018. Unlike what we have seen in New York, there is no significant seasonality when it comes to homeless encampments. 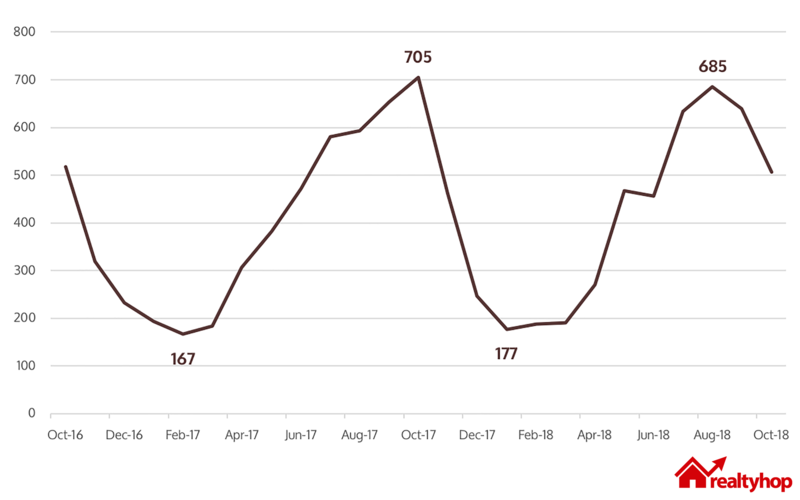 While indeed, February seems to be getting the least number of encampment reports, overall, the number of homeless encampments has been increasing in San Francisco in the past two years. In the month of July 2018, the number reached 6,882, and then gradually came down to 4,887 reported encampments as of October 31st, 2018. If the trend continues, by next year the number might reach 8,000. Family Holiday Helps have several programs that are perfect for families. Learn more here. Bay Area Rescue Mission is another great organization that has great Thanksgiving events for the homeless. You can volunteer here. The Food Bank has programs year around with the goal to end hunger. Learn what you can do to help now. Shelter is one of the most basic human needs. Whether we rent or own, at the end of the day, we all want a place we can call home, and we want to feel safe and protected. Unfortunately, as the housing prices reach an all-time high, finding a home, for many people, has become more and more difficult. This report aims to generate awareness on hunger and homelessness across communities in the U.S. The maps show us where most homeless people are – if you see someone in need of help on the street, take action. If you have time and energy, maybe you can even volunteer this Thanksgiving and deliver meals to people in poverty. Remember, it is good people who make good places.